In this game you can create your own fireworks in VR, prepare and mix colors, create different shapes or have the option to be an spectator and just enjoy the show in VR. There is a third mode which is an arcade mode where you can try to get a high score while shooting fireworks at different targets! 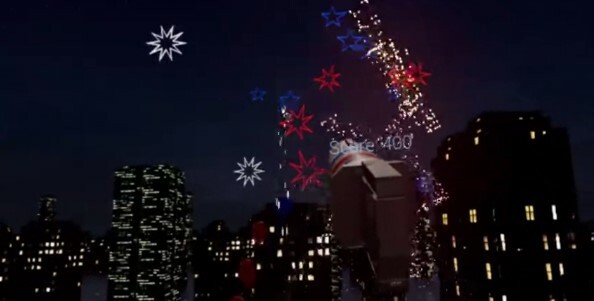 VR fireworks app— Fireworks VR One – that’s sure to put a celebratory spark in your July 4th festivities. Watch unbelievable fireworks shoot off in space while jamming to two upbeat techno music tracks. With the Oculus Rift, you can experience a VR fireworks display set to music with visuals that will amaze and excite. See the fireworks over the water and above the city buildings with VR Music Fireworks – Music Visualization. With Fireworks Show VR, a beautifully synchronized fireworks display over the open water, in high-def. The accompanying music will make the show even more exciting and the reflections of the fireworks onto the water are mesmerizing and super-realistic. This show can be viewed from all major VR platforms and is now available before the Fourth of July for those with Google Cardboard.